High temperatures across the western United States could set a slew of new weather records through the weekend, and residents across multiple states are suffering or taking off to higher, cooler ground. The extremely high weather across multiple states, including New Mexico, Arizona, and Nevada is exacerbated by drought conditions (little rain) in many areas, making the almost unbearable even worse. The National Oceanic and Atmospheric Administration, the United States weather agency, is warning that “even healthy people” in some of these areas are at risk of becoming ill from being outside for too long. People are taking different approaches to the heat. Water parks and areas are popular hang-outs at this stage, as is anywhere inside with air conditioning. But even while swimming people should be careful to drink lots of water. “Even though it feels cool in the water, you are going to be sweating because your heart rate is elevated; as well as the air temperature makes you lose a lot of water when you are swimming,” swim coach Chad Durieux told KTLA-TV in Los Angeles. At low-lying Lake Mead, which straddles the Arizona-Nevada border and is anticipating 120 degrees this weekend, rangers are positioned at trailheads to discourage visitors from hiking, according to local broadcaster KSBW-TV. Earlier in June, a group of Boy Scouts hiking in the Colorado River canyon fell prey to soaring heat. Four teenagers and an adult had to be rescued, while a 69-year-old Scout leader died. “We don’t want a repeat of the tragedy we had a few weeks ago,” Lake Mead spokesman Kevin Turner said. In California and other states, there are potential problems with the upcoming July 4 holiday and fireworks because of the lack of rain. Patzert and NOAA are recommending that people drink plenty of water, avoid consuming too much alcohol, which is dehydrating, and stay indoors during the hottest part of the day. People should also call 911 at the first sign of heatstroke, which can be fatal. The extreme weather is expected to continue until at least June 30 (Sunday). And one forecasting map, from several agencies keeping track of drought conditions, forecasts a dry and hot summer through September 30, with drought conditions either persisting or intensifying in many states. Along with the severe drought conditions in parts of the western United States, the danger of fires is very high across parts of eight states. California: Temperatures in some areas of the state are approaching record-breaking. 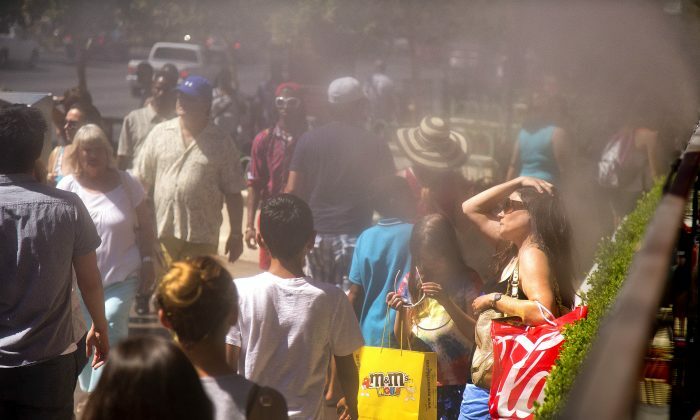 In Fresno, the maximum reached 101 F yesterday, and is expected to continue through Sunday. However, in other areas, such as San Diego, the temperature only reached 78 F. Although higher than normal, that’s far off from the record of 96 F set in 2006. “Those working or playing outdoors, and those without air conditioning are most vulnerable,” NOAA warns. “Even healthy individuals are at risk in these conditions.” In Flagstaff, meanwhile, record high temperatures (104 to 113 F) are forecasted through Sunday, with highs reaching near 107 F each day. Nevada: Temperatures in Las Vegas have reached 92 F around 8 a.m. PDT. The temperature yesterday reached a maximum of 109 F at 4:25 p.m. PDT, seven degrees higher than normal–however, the record (1994) is 115 F. There has been no rain in Las Vegas this month. The current temperatures are “dangerously hot,” according to NOAA. Temperatures in Death Valley are expected to reach 126 to 129 F. Across the state temperatures are expected to keep rising above 105 F and in some areas reach past 110 F.
New Mexico: Hot and dry conditions are expected to continue, including temperatures above 100 in some areas. Utah: The temperature was 88 F as of Friday morning, but could reach above 100 F, as it did yesterday around 5 p.m. (101 F), a temperature that is 13 degrees above the normal temperature at this time of year. The temperature record (102 F; 1958) was nearly broken, too. Utah is not as hot as other western states but is still being affected by the heat wave. Colorado: The temperature in Grand Junction was 81 F as of Friday morning, though temperatures are expected to rise again today. The maximum yesterday was 101 F, which approached the record of 105 F (1990), and was nine degrees above average. Very little rain has fallen in Grand Junction this month. At the same time, other parts of Colorado, such as Denver, are experiencing temperatures that are below normal. The highest temperature there was 73 F yesterday. Texas: Temperatures in the low 100s are expected to continue, including 105 in the El Paso metro area. Although temperatures aren’t close to the 113 record set in 1994, but temperatures reached 107 F yesterday around 3:30 p.m. There has been less rain than normal this month, only .12 inches. Maps showing the hot and dry conditions in the western United States.